Two of Marvel comics most iconic personalities are uniting in a stand alone feature for the first time in the new Spiderman/ Deadpool series. The Merc with a Mouth has recurrently garnered comparisons with Spider-Man by appearance and talkative style, but also serves as the perfect antithesis of Peter Parker. 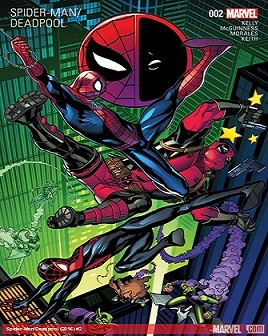 In fact Spider-Man was an inspiration to Rob Liefeld and Fabian Nicieza, who created the character of Deadpool (first appearing in New Mutants #98). Will the pairing be a match made in heaven? The running joke is that Deadpool is an ardent admirer of Spider-Man who can do no wrong in his eyes. Spider-Man on the other hand can’t stand the mouthy merc. The duo are pitted against some entertainingly dastardly super villains in Mysterio (Quentin Beck), Patient Zero, Mindful Ones. If that’s not a sufficient headache there is some shady business at Parker Industries. The first six episodes are engaging with some classic titles already. In issue #4, Deadpool manages to persuade Spider-Man to embark with him on a potentially awkward double date. The two females accompanying them amusingly were Shiklah (the demon queen of Monster Metropolis) and Female Thor, Jane Foster. In issue #6 (June 6th) Deadpool gets the Hollywood call and visits the set of a movie about his life. Wolverine and other comic legends appear in issue #6, portrayed by actors on film sets. This hilarious episode was written by Scott Aukerman of TV’s Comedy Bang Bang. A new villain was introduced Salmon Stunt Man (Donald Dryans). Writer Joe Kelly and artist Ed McGuinness are the creative energy behind this project and are co-collaborators in Deadpool comics dating back to 1997. Devotees of Deadpool and Spider-Man will appreciate this series. Anybody who is not very familiar with the comic book version, but enjoyed the Deadpool film should also check this out. Stay tuned for Issue #7 released on July 20.